This week ISR welcomes 10 undergraduates from across the country to our Research Opportunities in Miniature Robotics program. This opportunity is part of the National Science Foundation's (NSF) Research Experiences for Undergraduates (REU) program. The REU program supports active research participation by undergraduate students in areas of research NSF funds. REU projects involve students in meaningful ways in ongoing research programs or in research projects specifically designed for the REU program. This summer experience prepares students for graduate school or research jobs in industry and labs. In the ISR program, students learn about miniature robotics and applicable technologies and applications as they engage in interdisciplinary research projects. 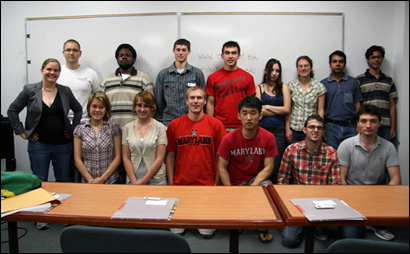 Over 10 weeks, students will develop research projects, attend technical tutorial seminars, visit local government labs involved in miniature robotics research, attend professional and academic development seminars, and tour Maryland’s top-notch facilities supporting robotics research including the FabLab and Neutral Buoyancy Research Facility. Coffee talk discussions will provide an informal setting for students and mentors to discuss technical and non-technical topics. The program culminates in student presentations on their summer research.